How do business leaders, industry experts, and passionate thought leaders all participate in one of the most exclusive events on the international calendar? SOCIAL MEDIA. Mercer understands the power of community, the power of relationships and the power of equipping its employees with the ability to speak with authenticity earned through their tenure with the brand. This year, we combined this power with the prestige of the World Economic Forum Annual Meeting in Davos, Switzerland, by developing a digital venue and platform for individuals to contribute to the Davos dialogue. 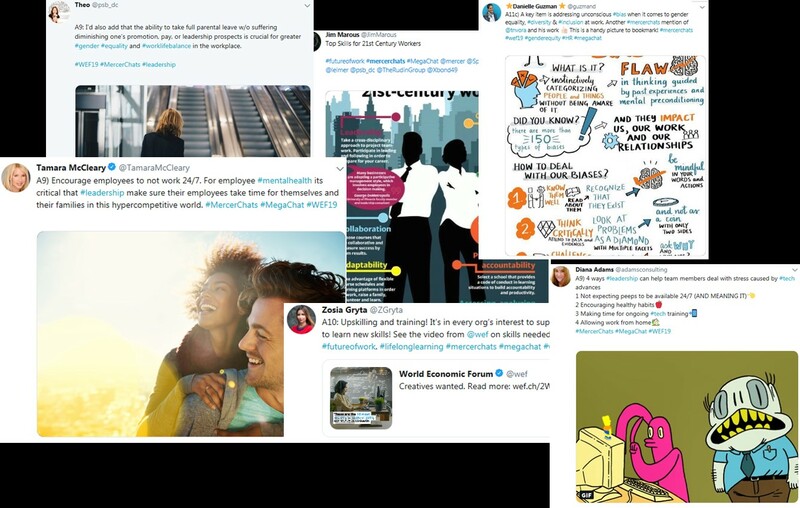 The result was #MercerChats #MegaChat, a three-hour Twitter live event that coincided with the first day of meetings on the WEF19 calendar. 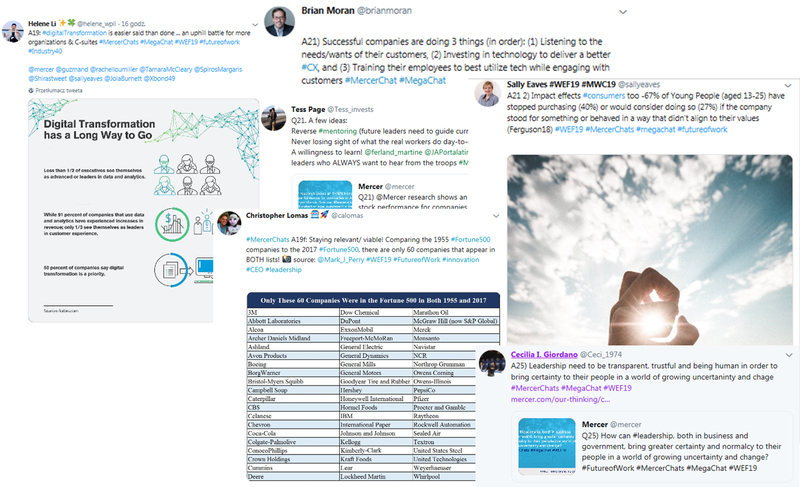 Over the course of #MercerChats, Mercer saw over 2400 accounts contribute to its online global dialogue covering key conversations happening within the halls of the global summit. The shared perspectives were as diverse as the participants themselves. 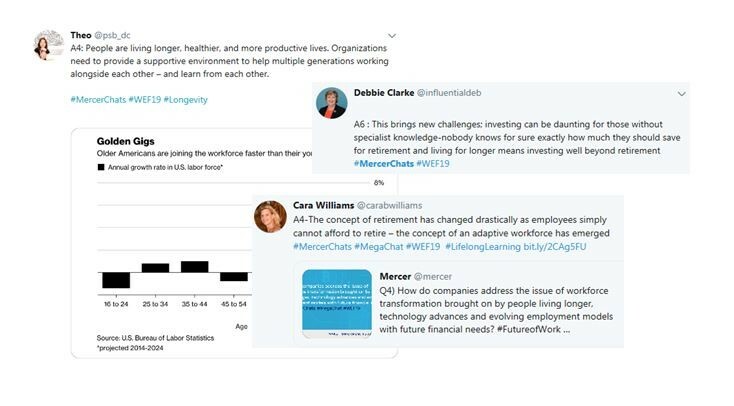 #MercerChats #MegaChat was framed around Mercer’s key #WEF19 themes – the future of work, diversity and inclusion and financial security. The digital dialogue joined with Mercer’s on-the-ground events to elevate, amplify and expand the conversation. Below is a summary of those inspiring conversations that reshaped what Davos can be and reimagined how global thought leadership can converge around a single event. The prospects and outlook for global financial security is a key focus for Mercer at Davos every year, and 2019 is no different. As individuals are living and working longer, it’s become increasingly clear that yesterday’s models for retirement and individual financial security will no longer be tenable in the future of work. This flash point, in addition to the growing world of fintech and cryptocurrencies that are transforming the market, makes this a critical moment in the future of finance and financial security. Participants in our #MegaChat recognized this, as seen from their insightful additions to our conversation. This year’s WEF Annual Meeting centers around the confluence of globalization, Industry 4.0, and the future of work, officially: “Globalization 4.0: Shaping a Global Architecture in the Age of the Fourth Industrial Revolution” – and our #MegaChat reflected that. From digital transformation to diversity, from the gig economy to robotics, our chat participants explored the constantly expanding limits of our work world and the major trends impacting our workplaces of tomorrow. One of the most nuanced and passionate branches of our online dialogue concerned the uncertainty around the necessary skill sets for the future of work. As organizations and individuals struggle to project the most in-demand skills for our digital future, the role of traditional education, upskilling and re-skilling were all up for debate. True to the nature of the World Economic Forum, another major focus of our #MegaChat was leadership and the evolving need to build and guide a workforce in our constantly changing world. One core issue discussed: as AI and automation remake the look and shape of our global organizations, leaders will need to adapt to a more fluid talent pool and mobile workforce.